FOMP needs you for this trail work session! FOMP is pleased to be holding our first monthly volunteer trail work session for 2019! The rest of the info you need: FOMP and USFS provide all the necessary tools. Volunteers should wear appropriate clothing for performing outdoor landscaping type of work. Volunteers should wear long pants and sturdy shoes, and bring leather gloves, a hat, a personal water supply, eye protection, sunscreen, and bug repellent. We meet rain or shine unless there is lightning active in the area. Be aware all participants will need to sign a wavier before than can begin any trail work. Thanks, and we hope to see you out there! This entry was posted in FOMP, Trails on April 4, 2019 by gram. The class is free and open to all new as well as experienced volunteers. If you are interested in learning more about FOMP and volunteering with us this would be a great chance to learn some new skills and see why we are passionate about taking care of our regional trails. After class participants will receive a free FOMP volunteer T-shirt. The class will consist of an overview of trail design and maintenance followed by two alternating breakout sessions covering drainage design techniques and standard bench construction. After lunch, we will have a brief overview of other topics such as switchback construction and technique for restoring closed trails. Class participants will have a chance to learn the very best current techniques for taking care of the trails we all use and enjoy. Participants are asked to bring a camp chair, lunch, water, sunscreen, gloves, clothes for working outside in and ones you won’t mind getting dirty in. FOMP will provide coffee, snacks, handouts and our collectible T-Shirt for participants. Course material is from the Pacific Crest Trail Association – Trail Skills College; The United States Forest Service – Trail manuals and The International Mountain Biking Association. This entry was posted in FOMP, Trails on March 17, 2019 by gram. Take your volunteering to the next level with Crew Leader Training! The training will kick off with a weekend-long course that empowers local trail volunteers with the skills to help lead safe and effective trail and restoration projects. 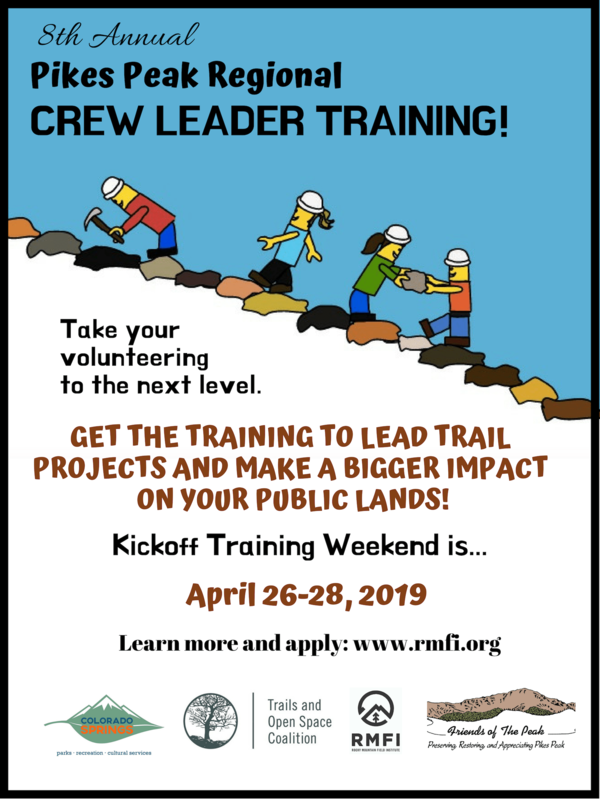 The Trails and Open Space Coalition is proud to continue to partner with RMFI and others to offer the 8th Annual Pikes Peak Regional Crew Leader Training. Applicants MUST be able to attend the full 2.5-day weekend training course and commit to completing 2 certification workdays under the supervision of Rocky Mountain Field Institute or Friends of the Peak within the 2019 field season. Cost: There is a non-refundable $25 application fee to help cover the costs of materials for the weekend. More information and application available at rmfi.org. Please email us at info@fomp.org if you’re interested in representing FOMP.org at this training. This entry was posted in FOMP, Trails on February 14, 2019 by gram. For this Eagle Scout Project, we will be working on an eroded trail near the Monument Rock. Please park at the main lot at Mt Herman/Nursery Road https://goo.gl/maps/5J1yar6b81x or Red Rocks/Mt Herman lot at https://goo.gl/maps/vj6UyuH6sek and walk on the trails to the location, please do not walk on the road. The rest of the info you need: FOMP and USFS provide all necessary tools. Volunteers should wear appropriate clothing for performing outdoor landscaping type of work. Volunteers should wear long pants and sturdy shoes, and bring leather gloves, a hat, a personal water supply, eye protection, sunscreen, and bug repellent. We meet rain or shine unless there is lightning active in the area. This entry was posted in FOMP, Trails on September 13, 2018 by gram. FOMP is pleased to be holding our last monthly volunteer trail work session for 2018! This entry was posted in FOMP, Trails on September 7, 2018 by gram. FOMP is pleased to be holding our fourth monthly volunteer trail work session for 2018! This entry was posted in FOMP, Trails on August 13, 2018 by gram. This entry was posted in FOMP, Trails on August 5, 2018 by gram. FOMP is pleased to be holding our second monthly volunteer trail work session for 2018! This entry was posted in Trails on June 8, 2018 by gram. FOMP is pleased to be holding our first monthly volunteer trail work session for 2018! This entry was posted in Trails on May 5, 2018 by gram.